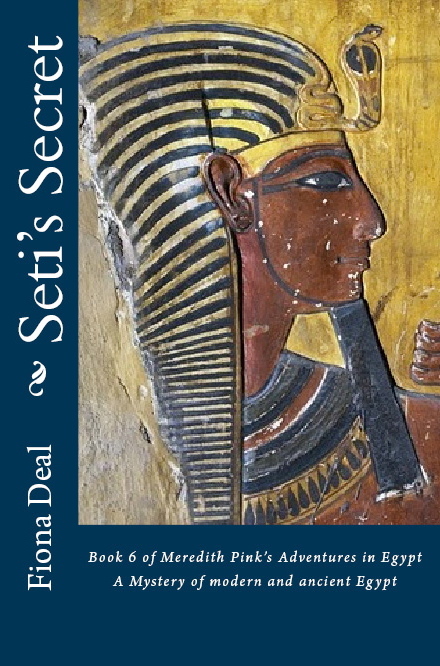 My latest novel in the series following Meredith Pink’s Adventures in Egypt is called Seti’s Secret. It is an adventure story set in modern-day Egypt but, as with the previous five novels in the series, it sets out to explore an ancient mystery. For this book, I have chosen the Exodus story, proposing the historical identities of the Pharaoh as well as of Moses himself. Publication of my book has coincided with Ridley Scott’s release of his Biblical film epic Exodus: Gods and Kings. I went to see the film yesterday, interested to compare my take on ‘The Greatest Story Ever Told’ with Scott’s. Since its release on Boxing Day, the movie has been banned in Egypt, Morocco and the UAE. Egypt cites historical inaccuracies in the film, including depictions of the Jews building the pyramids and an earthquake causing the parting of the Red Sea. Morocco has halted screenings because the film contains a “representation of God”, which is forbidden under Islamic Law. The UAE has supported its decision saying the film contains religious inaccuracies about Islam as well as other religions, although it has not specified these inaccuracies. I guess the movie-going public is arguably less concerned about historical and religious accuracy than it is about enjoyment. I won’t comment on whether or not the film is enjoyable – that is for each person who sees it to decide. I certainly found it epic, with sweeping vistas and grand stage sets – the plagues were particularly well depicted. But as a writer, accuracy is something I have to be concerned with, and there are a few points I’d like to explore. The opening title sequence tells us it is 1300 BCE (Before ‘Christian’ or ‘Common’ Era). This places us in the latter years of the reign of Pharaoh Seti I, who appears briefly in the early scenes of the film as the elderly king about to pass on his throne. To be fair to Ridley Scott, I’m not sure he represented the Hebrew slaves as building THE pyramids. True, the film shows workers constructing pyramids (in the sweeping panoramic shots of ancient Memphis) but I expect this is just for dramatic effect. The Giza pyramids were built some 1000 years earlier during the Old Kingdom, presumably long before the Israelite sojourn in Egypt as described in the Bible; and before the 400 years Scott’s opening titles claim the Hebrews have been enslaved. I guess it depends whether you’re prepared to accept that pyramids continued to be built in Egypt, even into the New Kingdom. A more interesting historical inaccuracy for me was the scene showing Seti I’s funeral taking place at the Temple of Abu Simbel – another piece of grand cinematography – but factually impossible, since Abu Simbel wasn’t built at the time, and Seti I was interred in the Valley of the Kings. If the film showed an earthquake parting the Red Sea, I missed it. I saw Moses go to sleep asking for divine intervention, then wake to find the waters had miraculously drained away to allow the Hebrews to cross. The special effects showing the seawater crashing back in again are among the most impressive in the film – although it is perhaps stretching credulity to the limit for both Moses and Ramses to survive the deluge, on their opposite banks of the Sea, given the on-screen violence of the Tsunami-like wave that engulfs the Egyptian army and both lead characters with it. The Bible is oblique about whether or not the Pharaoh survives being cast into the sea. The Torah is more specific in suggesting the Pharaoh drowns. Which brings me to what I consider the crux of the historical matter. Was Ramses II (Ramses the Great) the Pharaoh of the Exodus? Ridley Scott apparently believes so, as did Cecil B DeMille before him, in his film The Ten Commandments. Yet is there any historical evidence for his candidacy? Ramses II ruled Egypt for upwards of sixty years. His mummy is on display in the Egyptian Museum in Cairo and is of a man in his nineties when he died. So if he pursued the fleeing Israelites into the Red Sea he certainly survived it. Interestingly, the Bible never names a Pharaoh. So we are forced to look for other evidence in the Old Testament as well as in the historical and archaeological record to identify which Pharaoh is described. The primary argument in support of Ramses II in the Exodus story seems to be that the Bible states the Pharaoh subjected the Hebrews to harsh labour building his store cities of Pithom (the location used in Scott’s film) and Ram’ses. Ramses II certainly built a new capital city Pi-Ramses (or Piramesse). Its remains have been discovered under the modern town of Qantir in the Eastern Delta, close to a branch of the Nile that silted up approximately 1,000 BCE. Because Ramses built a city and named it for himself, hey presto he is the Pharaoh of the Biblical Exodus story. That’s it. That’s the evidence. What is perhaps not so well known in popular culture is that Pi-Ramses was apparently built on top of the remains of an earlier city. Historians have identified this as the Hyksos capital of Avaris and perhaps also the border city of Zarw, identified by some as Biblical Goshen, where the Hebrew tribes are said to have settled after their descent into Egypt. If true, this enables us to construct a rather different scenario. The historical record tells us that the grandfather of Ramses II, who ruled as Ramses I, was the Overseer of the Fortress of Zarw while still a commander in the previous Pharaoh’s army. As he shares the name of his more famous grandson, I think it equally possible that he was the one who oversaw the daily lives of the Hebrews living in the place his grandson later decided on as the location for his new city. The Bible also suggests the Pharaoh of the Exodus was not the same individual as the Pharaoh of the Oppression. Exodus 3:6 describes Moses’ reluctance to return the Egypt to free the enslaved Hebrews after God speaks to him from the burning bush. God reassures Moses that his life will not be in danger if he returns to Egypt as “all those who wished to kill you are dead”. The earlier section (Exodus 1:8) tells us “Now there arose up a new king over Egypt”. These passages suggest that during the years Moses spends in the wilderness, the previous pharaoh has died to be replaced by a new one. This would exclude Ramses II as being the Pharaoh to banish Moses and also the one on whom Moses unleashes the ten plagues. There is more evidence, of course. But, for now, I’ll end by saying if you’re interested in how the historical and archaeological evidence can be used to construct an alternative set of characters for the Exodus story, you may wish to read Seti’s Secret. (This is book 6 in a series, so I’d suggest you start with the first book Carter’s Conundrums). The books are available on all Amazon sites. As for the religious inaccuracies cited by the nations who have banned Ridley Scott’s film, I’ve decided they are the subject of a whole new article, which I will publish in the next couple of days. Posted on December 29, 2014 by Fiona Deal. This entry was posted in ancient Egypt, Egypt, egyptian fiction, fiction, film, History, monarchy, movies, Travel, Uncategorized, writing and tagged ancient Egypt, Bible, egypt, Moses, Old Testament, Ramses, Ramses II, Ridley Scott, Seti I. Bookmark the permalink. As for the date itself, I can forgive it. Dating the Exodus is difficult because Egyptian chronology during that period is nightmarishly confused. Agreed – I think that’s part of the enjoyment of running with different scenarios.